Voter participation is a social work issue! The NASW Code of Ethics standard states: Social workers should facilitate informed participation by the public in shaping social policies and institutions. 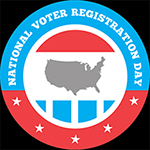 NASW offers resources and online training to help you get out the vote in your community.